We have seen generations pass with the i3, the i5, and the i7 processors from Intel addressing speed needs a system, a chipset, a GPU at a time. But with the growing specifications needed in modern-day games come a need to satiate the gap that expanded from a question if there’s more to gaming than an i7 processor. Hail the Intel i9 processor that comes with 8 cores, 16 threads, and consumes 95 watts when running on full throttled power. Because it can support a maximum memory size of DDR4 at 128 GB, and transfer data at lightning speeds of 41.6 GBs per second, it’s mainly designed to work with top tier gaming systems that can utilize the new Intel processor’s power. Comes in this list are five of the best laptops that can run the infamous Core i9 Processor. 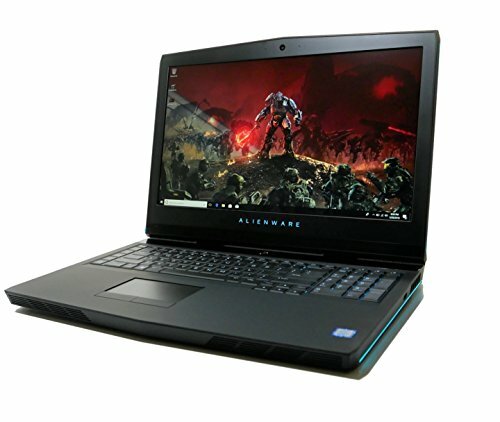 Expected that they are all gaming systems, you’ll see not just specs, but features that make the most of the beast that powers the operation of the whole laptop. And because there are certain laptop models that have customized configurations depending on budget and consumer preference, we’re taking the top-of-the-line variants to give you a glimpse of how much you can stretch your budget to gain the maximum benefits of owning an i9-powered laptop. The Alienware 17 from Dell is engineered to provide the ultimate gaming experience that’s all about surpassing what Earth has to offer. As for the processor, it carries an 8th Generation Intel Core i9-8950HK processor that has 6 cores, 12 MB Cache, and can run up to 4.8 GHz fast when optimized with a turbo boost. That kind of performance from a fast processor can be harnessed with an optional overclocked video card that can perform well through focused wattage output, contributory to an elevated graphics experience. You could choose among the NVIDIA GeForce GTX 1060, 1070, or the 1080, with an obvious call that the GPU with the larger number has better specs, features, and power. After all, if you’ll have a dedicated memory of over 8 GB that’s a GDDR5X with CUDA cores reaching to 2560, and a boost clock that revs up to 1771 MHz, then you’ll definitely not choose something lower. As for the display, you’ll have a feast with 17-inch goodness that supports Full HD and Ultra HD, while enjoying your viewing or gaming experience with an anti-glare finish that lessens obstruction with lighting. Alienware also gives its users the option of adding an eye-tracking technology that lets you control your in-game camera view by just moving your eyes. With an extra $50, the Tobii eye-tracking becomes yours to deploy, completing your immersion in the game as if you are actually inside it. As for memory, you’ll get two 16GB DDR4 2666 MHz RAM, which makes things fast for your data and multitasking process without the lag and all the speed you require. For the hard drive, Alienware suggests that you take on Dual Drives for your files and for gaming, particularly a 512GB PCIe M.2 SSD and a 1TB 7200RPM HDD. The solid-state drive would be utilized for installed games where the SSD makes it possible to run and maintain games with faster processing time. The hard disk drive is for your storage. Here’s where you install applications that does not demand too much data, store photos, videos, and music files, along with documents, spreadsheets, and other files that does not consume and demand real-time rigorous processing. Another recommendation coming from Alienware has to do with the wireless adapter that’s installed within the laptop. A Killer Wireless 1550 2×2 AC and Bluetooth 5.0 could do wonders, not just for transferring data, but more importantly, for connectivity that can withstand disturbance, and for consistency that does not ruin your game. With everything top-tier, being a very power-hungry gaming laptop, the Alienware 17 deserves a battery that can go far, even at the expense of performance, of great speeds, and seamless operation. With a top-of-the-line purchase, an additional Lithium Ion battery with 99-watt hours should do the trick. ASUS laptops have the reputation of being tough, dependable, and efficient. That goes breadths past with their Republic of Gamers series, gaming laptops that offer performance that ARE notable in the gaming market. In fact, ASUS is confident that the G703 is past to what a souped-up gaming desktop could offer, across the board. 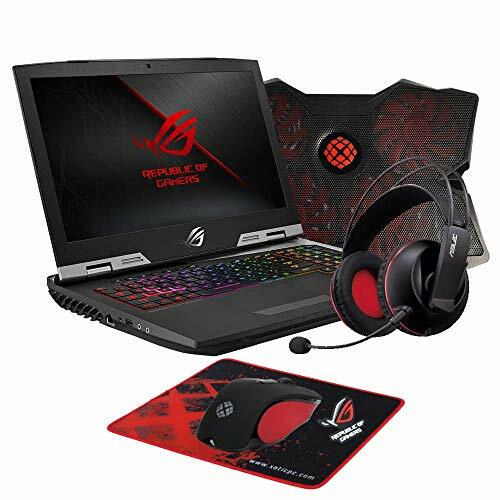 No, it’s not just about portability, but it’s also about quality and dependability that nothing goes wrong with your game as long as you have an ASUS gaming laptop to satiate your need. Everything’s powered by a factory overclocked Intel Core i9-8950HK that can go up to over 4.8GHz, 10% faster than its base speed. With technologies supported such as the Intel Hyperthreading, speed shift, and Turbo Boost 2.0 and you’ll get a system that knows no limits. Bundle it with an NVIDIA GeForce GTX 1080 GPU, coupled with an overclocked 8GB GDDR5X VRAM and you’ll have an additional 1974MHz and 10.3GHz. With all of the pieces fit together to provide seamless and clean graphics that can surpass any kind of lag, you’ll experience playing games at over 90 to about 150 frames per second, with no glitch, slowdowns whatsoever. The excellent feat with next generation GPUs is that it enables hardware and software support for Virtual Reality games, driven by NVIDIA’s VRWorks. You’ll not just see games as immersive, but you’ll feel and hear them, as if you’re playing in your own gaming world. What makes ASUS high-end laptops an amazing system is its deployment of exclusive technologies that are not available in other brands. One of such innovations is the HyperDrive Extreme that combines three NVMe PCIe 3.0 x4 SSDs. This does not only merge the storage size, but it also unifies performance 7of the three SSDs so everything’s 3 times faster! How fast? What’s 8.7 gigabytes per second and all the games that could load up, run up, and hype up without the spills and the inconsistent mess. More to the ROG G703 is an ultra-responsive display that features the NVIDIA G-Sync technology, providing display that’s smooth and seamless as it makes the monitor capable of rendering graphics with a 144Hz refresh rate. There’s also the 3ms gray-to-gray response time that makes blurring a thing of the past, delivering fast-transition graphic movement that’s precise to the detail, eradicating distorted visuals. Care to render your ambiance keyboard color down to specific keys? The Aura RGB Lighting technology offers customization that’s more detailed than being provided by most laptop brands. Excluded colored keysets, such as the WASD keys, are rendered with highlight and anti-ghosting technologies. Imagine the feeling of playing with a keyboard that’s curved to the finger, pressing keys with a minimal 2.5mm travel distance, and an anti-slip palm rest that lets you stay comfortable while playing at the prime of your game. And the keyboard is not just configured for exclusion. You could also access other keyboard configurations to the Xbox Game bar, ROG Aura, Gaming Center, and XSplit Gamecaster. There’s all the reason to be really happy with performance, but it does not stop there. The ASUS G703 makes your investment worth every penny, especially when it comes to maintenance and upkeep. With ASUS’ patented Anti-Dust Cooling system, your laptop becomes capable of cleaning itself from all the collected dust and particles that were acquired with many years of use. What it does is that it ejects accumulated particles through dedicated tunnels, blowing air through ultrathin fins, cooling the whole system while doing the cleaning. 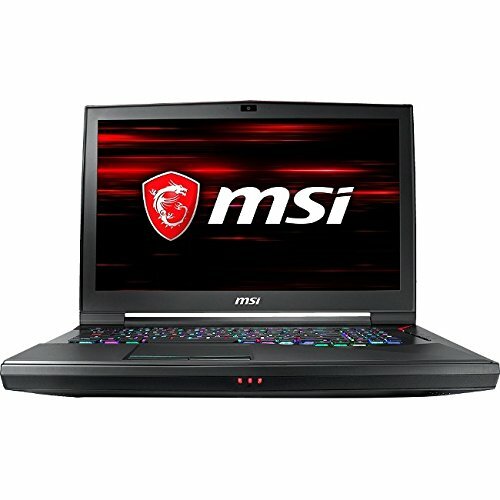 In order for the MSI GT75 Titan to reach its full potential, its overclocked Core i9 Processor needed additional cooling that’s provided by the Titan’s Cooling Boost, making it possible for the gaming laptop to reach top speeds without the worry of a meltdown, more so, lagging performance when the demand is great. Among the top selling points of the GT75 Titan is the level of comfort provided to its users, inspired from one of the previous MSI models, the GT83. Aside from the enhancement in design that’s familiar to many sci-fi fans, ergonomics, along with strategically-placed rest pads provide comfort that’s reliable for playing long hours, especially in tournaments. One of MSI’s innovative developments appear on the keyboard. With a “Rapid Mechanical RGB Keyboard” that’s designed to provide gamers a pleasant gaming experience, expect that you’ll feel the difference with faster response, more receptive keypress feedback, and a more mechanical feel that’s not common with laptop keyboards, even on gaming ones. With travel time that’s only 3mm short and actuation of only 1.5mm, you know you’re in command, with response that’s almost instant. Customization is also one of the assets with the Rapid Mechanical RGB Keyboard as you could modify the lighting effects of the keyboard as a whole or per key with the SteelSeries Engine 3, depending on the game profile you want to apply the changes with. For monitor performance, you’ll win a millisecond faster as the response time of the panel for image render is only 3ms, displayed at a refresh rate of over 120MHz at Full HD resolution. It can seamlessly project visuals at up to 120 frames per second, excellent for fast-pacing video games. With NTSC Color Gamut calibration at up to 94%, you’ll see deep and rich colors that’ll provide you a pleasant viewing experience, whether in playing games or watching your movies. Another technology applied for improving image quality is the True Color 2.0 that provides a color visible range of 100% sRGB that shows color accuracy while lessening the impact of blue light. There are some performance tweaks to make sure that you get the most of your laptop. For memory, the MSI chipset within the GT75 Titan can accommodate a DDR4-2666 RAM, which is about 10% faster than the previous most viable option. There’s also a profile management system for balancing and optimizing temperature and performance called the “MSI Shift”. With it, you can choose to go on Turbo Mode, Sports Mode, Comfort Mode, and Eco Mode. For connection, MSI is utilizing its Thunderbolt 3 port that binds 40Gbps of data transfer speed, 4K LCD Output, and device charging power 5V at 3A, all in one powerful port. MSI did not forget the audiophiles who love to experience high-resolution audio, as a sampling rate of 24 bit/192kHz would be a standard across the board. With the ESS Sabre HiFi DAC, it enables the laptop to produce audio fidelity that covers details clear and clean, giving your ears some pleasant listening. To provide users with a customizable audio experience, the Nahimic 3 Interface makes it possible to configure voice, music, effects, and even surround sound to your heart’s content. 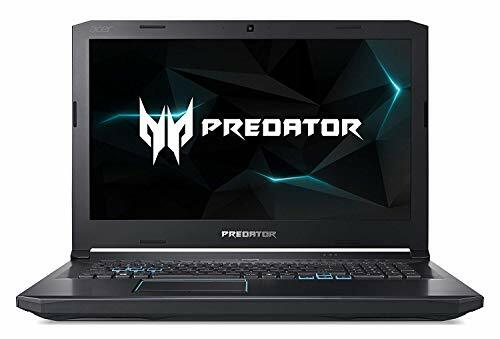 The Acer Predator Helios 500 packs both the looks and the specs in order to accommodate the performance and the feel of what it means to optimize the power of the 8th gen Core i9 processor. With a 17.3-inch IPS display, you’re in for viewing pleasure that’s accurate to the last visual detail. Whether you’re fond of seeing things in Full HD, or you’re demanding for sharp and clean at 4K resolution, both needs are met with a screen refresh rate at 144Hz, along with anti-aliasing technology. In order for the predator to keep things cool, even when in heat, AeroBlade fans are in place to promote airflow that can keep the laptop intact in spite of staggering graphic operations and taxing multi-tasking challenges. Located on the left and right sides inside the unit, two of these AeroBlades strategically use its conducive heat distribution and exhaustion through its ultrathin metallic blades. Another feature in the Helios 500 is its capacity to store heat at the right places for proper and concentrated cooling. Five heat pipes make it possible for the Acer gaming laptop to manage heating, which in turn, cools things down faster. Intelligent cooling? Acer’s CoolBoost technology automatically adjusts fan speeds to adapt with the level of heat that’s generated within the board at any time. One thing unique with the Predator Helios 500 purchase is that you’ll have the option of choosing between the NVIDIA GeForce GTX 1070 or the AMD Radeon RX Vega 56. Both are ready and able to render hard graphics, along with providing speed that lets you enjoy your games without the worry of lag, stutter, or delay. When it comes to memory, Acer provides you with an inclusive 16GB DDR4 RAM. However, you have the flex to crank things up and max your RAM to over 64GB that assures activity and productivity, even with multi-tasking difficulty. As for disk space, you can use both SSD and HDD. Per Acer, their suggested setup involves using two PCIe NVME SSDs in Raid 0 and 2 TB for HDD storage. The result, disk drives that run optimally for games or for files that lessens bottlenecks when opening programs or running operations in a heartbeat. And in case that you need to customize the RAM and the disk space on your own, you don’t need to go through the hassle of unscrewing the bottom plate for changing your peripherals. The Helios 500’s bottom cover is simple to remove that you won’t need additional tools to feed the need for a memory increase. In order to make the most of the 8th Generation Intel® Core™ i9-8950HK Processor in the Dell XPS 15 9570, it had to provide something extra in pushing the gaming laptop to the edge. Unexpectedly, Dell decided to incorporate touch screen technology as an additional way of interacting with the laptop. After all, it’s not easy to cram in 12 MB Cache, 4.8GHz, with 6 cores, while everything is enclosed on a pretty standard screen size at 15.6 inches. 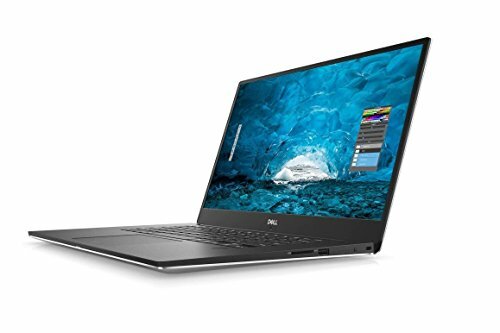 As far as the GPU is concerned, the Dell counterpart of the power laptops in this list brings in a little lower, particularly the NVIDIA GeForce® GTX 1050 Ti that has a dedicated memory of over 4GB RAM, excellent for playing video games and watching movies that will not be subjected to distortion or glitches. The XPS 15 Touch will work well using its RAM with two 16GB DDR4-2666MHz, all for the sake of speed. Consider everything small on this laptop. Slim at 11 to 17mm, weighing only 1.8kg, and a screen that’s unique in its class, this version of the XPS is an epitome of what it means to be small but terrible! When it comes to graphic display, the UltraSharp 4K Ultra HD display guarantees that every inch of detail can be seen by the naked eye, without the need of zooming in for additional image quality. As for the color profile, it is pleasing to know that the XPS 15 is using the Adobe RGB Color for precision in color rendering on images, both on basic viewing and in gaming modes. Any gamer has felt the need for speed, especially when their games are just as demanding when it comes to rendering graphics, handling visual effects, displaying crisp and clear details, along with playing immersive and comprehensive audio. This is one of the reasons why computer processor manufacturers are into pushing their innovations to the edge in coming up with a system that could keep up to rigorous and challenging consumer demands. Obviously, the gaming laptops for the i9 provides a wide range of features and technologies that make the powerhouse processor a bang for your buck! From graphics, to cooling, and even design, all are considered to be thematic for a laptop that’s developed to be a beast, a monster, or a killer. The competition begins and ends with exclusive innovations that are only found on a particular manufacturer. Some have tech for disk spaces that can optimize processor speeds, while others are able to utilize eye-tracking technologies that give a whole new meaning to immersive gaming.